I decided to make this a 4 day weekend. Actually all weekends should be 4 days long, but I don't seem to be able to convince the powers that be of that. I slept in until 6:00AM this morning. Aren't you proud of me? But there's a downside to having a long weekend. I have to do some housework. Living by myself, I can put a lot of things off thinking I'll get to that later. And every day while I'm at work, I plan what I'm going to do when I get home in the evening, but for some reason when I get home, all those plans fly right out the window. It's like I realize just how tired I am about 5:30PM. I drag myself in, throw my stuff down and just fall into my recliner. Thank goodness I don't have anyone waiting for dinner or laundry or anything else. So, I have to get up and get going this morning. I'm helping daughter#2 with a baby shower tomorrow, so I have to make some goodies. I'm thinking that will be tortilla pinwheels and some fudge. I have a tablecloth to iron and need to gather up the punch bowl and a few other dishes she will need for serving. This is a diaper shower for her sister-in-law, and I took Princess#2 with me to buy them yesterday and she wanted to buy a boy bib, I thought she was saying boy bed and I kept telling her I couldn't afford one of those. But she finally made me understand and wanted me to put a name on it. I assumed she wanted the baby's name on it, but she wanted her sister and her names on it. I explained that we really wanted the baby's name on it so she was satisfied with that. What are you doing different today than you normally do on a Friday? If I know what you are going to do, I may change my mind and do something different. Have a wonderful Friday. Love one another. We have a group called Senior Singles at our place of worship. We have a deacon who oversees the things they do as a group, and one of those is that once a month on Thursday, they all meet somewhere and eat lunch. That's today. The way they decide where to eat is that whoever has a birthday the next month gets to choose. And it's usually the Catfish Cafe. This place has really good catfish, the hush puppies are just right and they have really good baked potatoes. Can't recommend the cole slaw, but that's just me. In order to be a part of this group, you have to be at least 55, and since I'm 59, I get to be included. However, that makes me the youngest in the group, and I'm one of two that still works. Everyone else is retired, well that is except one lady who is 85 and still runs an alterations business, but she is very selective of her clients and just does what for who she wants to. We meet at 11:30 and we usually have a few guests. One or two of the elders join us sometimes, some of the deacons, sometimes our minister or associate minister, and anyone else who wants to can join us for lunch. It's dutch treat. We have a lot more ladies than gentlemen, and since ladies aren't allowed in the business meetings, it's nice for to have those in charge come and join us. Since we don't have husbands to go to the business meetings, we can ask questions and they can keep us informed as to what decisions are being made, and we can actually voice our opinions on what is going on. Mostly we just have great fellowship. It's a way to get to know people with whom we worship. We have two services on Sunday morning, and the second service, which is the one I attend, has about 550 there. The early service runs about 150. Being creatures of habit, I sit in one spot, and you don't always get to know the people on the other side of the building. We have 20 minutes between class and worship, and that's when a lot of folks mill around and meet and greet. I have a hard time doing that. I was taught to find a seat, get in it and be still(did you hear my mother's voice?). So that's what I do. I do talk some to the people around me, but there are still a lot of people I don't know. I keep saying I'm going to learn everyone, but I haven't yet. I'm looking forward to being with the group today. They are the youngest bunch of old folks you will ever fine. They are very active. We have two master gardners in our group. We have a retired post master, a couple of retired school teachers, a retired engineer, and a group of people who have worked very hard all their lives and are now enjoying their golden years. Then of course there's me a working computer programmer/analyst and the other gal who's still working full time. She works for a large medical group. I think she could probably retire except she's not old enough for medicare and has severe diabetes and has to have medical insurance, and since she can't afford private insurance(if she could find one that would take her), she continues to work so she can be part of a group insurance. I've rambled enough. What are you going to do fun today? For those of you on the gulf coast, go right now and get batteries, food and water, and board everything up and be ready to get out of dodge on a moments notice. Don't want to lose any of you, and I don't think your wireless will work very well on top of your house. Have a great Thursday. Love one another. My posts have been very serious these last few days, as well they should have been. But I promised things would be lighter today, and what could be lighter than a joke. I don't tell jokes very well, so I've plagerized one, well actually two. Here goes. A mom was concerned about her kindergarten son walking to school. He didn't want his mother to walk with him. She wanted to give him the feeling that he had some independence but yet know that he was safe. So she had an idea of how to handle it. She asked a neighbor if she would please follow him to school in the mornings, staying at a distance, so he probably wouldn't notice her.She said that since she was up early with her toddler anyway, it would be a good way for them to get some exercise as well, so she agreed. The next school day, the neighbor and her litt le girl set out following behind Timmy as he walked to school with another neighbor girl he knew. She did this for the whole week. A young blonde knocked on the door and asked the gentleman who answered if he might have some odd jobs she could do to earn some money. He said he needed his porch painted and offered to give her $50 for the job. She accepted, and he gave her the paint, brushes and other equipment she would need. When he went back inside the house he told his wife he felt a bit guilty about the price they'd agreed on since the porch went almost all the way around the house. A short time later, the young woman returned to the front door and told the man she was finished and that she had actually done two coats. He was quite surprised, but gave her the money and thanked her. I hope you have had a good laugh today. My jokes may not have made you chuckle, but I thought they were cute. Have a great Wednesday. Attend Bible Study tonight. Love one another. If you've been reading my posts the last few days, you know about the tragedy in our small community. Little Addison(I think it should be Adyson) is now an angel. Her parents had the presence of mind to give a great gift to several other people. They donated her organs. How totally unselfish an act that was. And what a wonderful thing to do. If your child can't live, others can. The news said yesterday there would be no criminal charges filed against either the home owner or the day care provider. She will get her license back. The questions is whether she will be able to re-open. She is not doing well. This has devastated her. The parents are not blaming her, in fact, they have been very supportive of her through this ordeal. And that seems strange, you would think it should be the other way around, but if you know Beth, then you know why she is having such a hard time. She is one of the sweetest, most loving people you will ever meet. I've said very little about the home owner, but they are good people too. And they are having a hard time dealing with the fact that they could have prevented this from happening by making sure the ladder was removed from the pool. They are taking the blame, and some say they should. But it was just one of those horrible tragedies that happens. Thank you for all your prayers and please keep praying. I promise tomorrow will be upbeat and happy. For most of us it is back to work on Monday, or at least to our normal routine. Unfortunately, for the family of little Addison, their prime concern this day is to begin the process of saying farewell to their precious little girl. Her life support was turned off sometime yesterday. I learned of her passing about 2:30PM. For the rest of us, the world is turning today. Theirs is not. I remember when I lost my mother, it was as if the world didn't care about me and my loss. I didn't want things to get back to 'normal'. But as I sat in my grief, everyone else went on about doing what they would normally do. I know this is how this family will feel, if they do not already. Eventually, your support system can't be with you 24/7. They have lives too and must go on about daily living. Eventually, your family will have to go home, and get on with their lives. And lastly, you have to move forward. I'm sure this family is making arrangements today for the burial of their baby. I can't fathom the thought of doing this with one of my children or grandchildren. But it is something that many people have to face. We do not know why. When I spoke to my brother last night and told him about this tragedy, his comment was that one of the questions he wanted to ask when he got to Heaven was 'Why little children?' 'Why do they have to suffer?' These are some of those questions we will never know the answer to while we linger here on earth. We know God has a plan. But as humans we question that plan. We don't always take what happens to us on blind faith. These young people are going to need a lot of faith to make it through these next days, weeks and years. If you have time to say another prayer(and I know I've asked you to pray a lot these last few days) please ask God to add to their faith that they may be with their little angel some day. Have a wonderful Monday. Love one another. This is a difficult post. We had all hoped for a miracle, but none has appeared. It is my understanding that two extesive tests have been conducted, and there is no brain activity for little Addison. Her maternal grandparents have arrived from their home in California and are helping her parents deal with this horrible situation. What that will be, I do not know at this time. My information comes third hand through different sources, so I don't immediately know what is transpiring. Please continue to pray for these families who are directly involved. That includes the family of the little girl, the family of the day care facility, the family whose pool was involved, and all the families of the children who were staying at the daycare. The daycare will be closed until the investigation is complete and may never re-open. One of the churches in the community will open its doors to care for those children who now need a place to stay, until other arrangements can be made. May the grace of God help us all to deal with this. Have a good Sunday. Love one another. Yesterday the unthinkable happened in our small town. We are a town of about 15oo people. If you've lived here very many years, you know there we are a close knit bunch. We have about three daycare facilties here, and yesterday a 23 month old girl managed to escape and was found in a pool next door. I have known the owners of this daycare for over 40 years. The lady for whom the daycare is named, and I raised our children together. My oldest daughter and her youngest daughter were inseparable. The older daughter runs the daycare. The kids all call her auntie. This is because when she first started the daycare, three of the children were her neices and nephew and that's what they called her. Now she is auntie to children of all ages. My now eleven year old grandson stayed there when he was very small. Needless to say, these people are more like family than just friends. Auntie loves children and has raised two of her own. She is well respected in our community. In a strange twist, the little girl managed to get away and out of sight for a few minutes. There is a block of time in the afternoons that Auntie goes to pick up after school children, and her daughter and the other helpers are responsible for the children. There are also people coming and going about that time picking up their children. When they realized she was missing, a frantic search began. Police were called. A neighbor found the little girl in the next door neighbor's above ground blow up blue pool. CPR was started and done until the paramedics came and took over. When they left with her, she had a pulse, and was taken to the nearest hospital. Around 6, she was flown to Children's Hospital in Little Rock. At ten last night, the news reported she was in extreme critical care, but was holding her own. Our entire community is in constant prayer for this child and her family. We are also praying for Auntie and her family. We are so grief stricken. When we talk to each other trying to find out how everyone is doing, we are unable to talk without getting emotional. Please pray for all of us. Pray for the little girl and her family. Her name is Addison. Pray for Auntie and her family. We need all the prayers we can get. I hope you are having a good Saturday. Love one another. With all the flooding caused by Tropical Storm Fay and seeing the footage of folks with water in their homes, I got to remembering the 1957 Overflow that occured in our area. We'd had an exceptionally hard winter and had been without power due to an ice storm that lasted several days. I don't remember much about that, I was only 8 years old at the time, but I have vivid memories of the water rising in the spring and some of the things that happened during that time. I have some timelines of a few of the things that happened because I had a baby brother born in April of that same year and as if that wasn't traumatic enough, we had that dang flood. It was in May and almost time for school to be out. The river, which was very close to some of property we farmed had begun rising. My Dad along with a lot of other men were spending time walking the levee's trying to keep them from breeching(a word I didn't know back then). They were sandbagging and doing what they could to keep the river on it's side of the levees. But the water outside was rising also. Some was probably from rain, some from seep water. At any rate, it became apparent that if it continued, it would be in our house before long. Our house didn't sit on the ground on a concrete slab like many houses today. It was a small wood frame house with asbestos siding and a tin room. It sat on blocks. You could lie on the ground and see all the way from one side of the house to the other. You had to go up about 3 or maybe 4 steps to get on the front porch. But the water was rising and my Dad began making plans to move us out to higher ground. He took my Mother, my two brothers and me to stay a few days with my Mother's sister in Jonesboro. They weren't in any danger there. He took all the livestock to the sale and got rid of them. This included the milk cow and probably 20 or so pigs. I don't remember what he did with the chickens, but they had nests high enough that they probably weren't in any danger. Our furniture was all moved into cotton trailers and covered with tarps and also moved to higher ground. Looking back, I'm sure my parents were terribly distraught, but it was a grand adventure for my older brother and me. My younger brother was just a month old, so he has no memories of it at all. After several days, Daddy came and collected us. The water had begun to recede and we were no longer in any apparent danger. The money Dad had made from the sale of the livestock would have to help us through the rest of the year, since there was no crop that year. Cotton should have and may have been planted in April and May, but was a distant memory after the flooding. We were in desperate times, but we kids didn't know it at the time. It was only some years later that I realized just how bad things could have been when I remembered that my grandfather gave my brother a pig. I'm thinking he gave it to my brother because he knew how much pride my Dad had and probably wouldn't have taken it if offered to him. But that pig was probably a life saver to our family. We kept it, and as we had the money, added another and soon we were back in the pig business. Somewhere, Daddy got the money to buy another milk cow and the big flood became a historical event that was brought up in conversation from time to time. What events changed your life--maybe without you knowing it until years passed and you grew up? Might not have been a flood, may have been a death or a move, but that at the time, you didn't realize the ramifications of it all. This is your self-appointed psychoanalyst here. Spill it. Have a great Friday. Love one another. Does this little girl look like she loves her Passie? She was a year old in June, and her mother began talking about taking away her 'baba'. I'm glad her mother(my wonderful DIL) didn't take both away at the same time. I think that would have been really hard for her. The trauma of losing her baba was hard I'm sure, but to lose both at the same time would have warped her little psyche really badly. They are building a new house, and hope to be in it by the end of October. Her mom said she will wait until they get settled and she gets acclimated to her new surroundings before she trys to take it away. I think that's a good thing. Then there's the blanket. She will probably carry it as 'something old' in her wedding or maybe I could make her prom dress out of it. Her brother(Superhero) still sleeps with his doggie quilt and he's four. I see no harm in dragging a blanket around for a few more years. Every child needs a little security. But then, I like a little security too. What's your security blanket? Could it be your cell phone, a certain piece of clothing, a favorite set of underwear? What do you get all up in the air about if you don't have it or can't find it? One of my favorite sayings is that Time flies whether you are having fun or not. Let's discuss. I was talking to a co-worker yesterday at lunch about that very thing. His contention was that time is the same. It goes at the same pace regardless of what you are doing. I know, you are saying, yes, he's right. A minute is the same length regardless of what is happening around you. But at the same time, lets examine that. If you are busy, the day goes by and is gone before you know it. If on the other hand you are sitting waiting for a light to change, that is the longest minute ever. If you are waiting on your car pool and you got a late start or overslept, they are outside honking before you find your last earring, and then you don't have time to make your lunch. On the other hand, if you are ready and waiting for them, they take forever to get there even though they pull up at 7:10 every day rain or shine. If you are sitting in the Dr's office waiting for a shot, how long is that minute? Well, that seems to depend on whether you hate shots or not. If you hate shots, they are there before you can even take a deep breath. If you have someplace else to be in the next few minutes, it seems like they never get there. If you have company coming and you need to add a few finishing touches to your house--short minutes. If you are trying to finish a project before a meeting starts--short minutes. If you are waiting on news about a loved one--long minutes. If you are living with pain, waiting for your Dr's appointment--long hours. Time is relational to the events happening in your life. Is that a true statement? I've often said, This is the longest day I've ever spent--most likely, I was not having a good time. When I've said, This day has gone by so fast--most likely, I was having a good time or was very busy. I'm sure that for my friend Robbin and others who are taking treatments, sitting hooked to the machine that feeds the medicine in, is a long few hours. I also would guess that time between treatments is short. Once the treatments are complete, I would think it seemed to go quicker than thought. Tell me about your take on time. Do you have a lot of it? Or does it slip away like the song says, "Time keeps on slippin, slippin, into the future". I read a blog yesterday about how pictures today look so young in 10 years. You may think you are fat today, but in ten years, you realize how good you did look back then. I've spent enough time on this subject. Let me know how you use your time. Wisely or foolishly. Have a wonderful Wednesday. Love one another. Yes, school started back in our area yesterday. There were school busess everywhere and lots of mom's late for work getting their children situated. When I went to school(let's not mention the year I started), my mother simply put me on the school bus that came by our house. I had an envelope with all my information and lunch money in it. I don't even remember that first day. I don't know if I was so traumatized, or if I was just in some sort of haze. We didn't have kindergarden, but I was only 5 when I was sent off to join the ranks of the first grade. I started to school in July(we had split term back then) and I wasn't 6 until the following January. I would like to think my mother knew I was mature for my age, but what I really think is that she got tired of having to listen to me talk and sent me to school so someone else could. All the other kids were born in 1948 or earlier. I was a 1949 baby. This made me the youngest in the class, something I hold over their heads til this day. Even though I'm the first to have a birthday in our group, they are all older. My granddaughter(Princess#1) started kindergarden yesterday. You can see her mother's post here. I couldn't quite figure out what caused my daughter to be in such a mood about it. After all, she's been in some type of day care since she was 8 weeks old, and even went through pre-school twice. But my DIL pointed out something yesterday afternoon when we were talking about it. She said with day care, you are in charge to a great extent. But once they go to public school, you lose some of your control. It's just a different world. It also shows they are growing up and leaving us. First it's kindergarden, then college, which is what Superhero thinks is the normal progression. We grew up, our children grew up, and now our grandchildren are growing up. Reminds me of the scripture, 'To everything there is a season'. Seasons come and seasons go. I think I'm in the winter of my life. My grandchildren are in their Spring. Into what season do you fall? Hope you have a great Tuesday. Love one another. I'm beginning to worry about how bad this winter is going to be. I had a lady tell me one time that for every fog you have in August, there will be a snow during the winter. When it got daylight Saturday morning, I realized that it was foggy. This makes about 5 fogs we've had and August is just about half over. If this is a true indication of what we will have this winter, we're in trouble. We usually have some snow, maybe a light dusting before Christmas--hardly ever a white Christmas, but then along about mid January or February, we will get whatever type of winter we are going to have. I don't know if severity of the snow has any direct relationship to the density of the fog, but so far none have been to thick. They usually burn away when the sun gets up. And it seems that with fuel so high, winter will be bad. Just the way we've had such a hot summer. Maybe there's some connection to fuel prices and hot summers and cold winters. I think that is how the rich get richer and the poor get poorer. As a side note, school has started today in our area. All the little kiddies are learning new teachers and making new friends. Princess#1 started Kindergarten, and Princess#2 moved to the Pre-school building. Here's a picture of the nap mat cover I made for Princess#1. It consists of two towels sewn together on three sides with button tabs at the top. It turned out really cute, but I can't see her dragging it home to be washed and with all the head lice in schools these days, it will have to be washed regularly. Changes, life if full of changes. My babies are growing up, and I'm growing older. How is your Monday going? Are you at work? Are you home? As for me, I'm working today. Whatever you are doing today, I hope you are having a wonderful Monday. Love one another. When I got off work yesterday afternoon, I decided to spend part of my meager paycheck on enough food to feed my wonderful family Sunday lunch. I spent $57 and brought home four small bags of food. I bought what I thought would be everything I needed, and enough frozen dinners and pot pies to feed my next week. I splured and bought a box of cereal. Special K with cinnamon and pecans. I paid 4.49 cents for a box that was narrow and short. I'll be lucky to get 5 bowls of cereal out of it. A half gallon of 2% milk was 2.39. Food is getting so expensive that I may have to rethink eating. But then you can't take your medicine without eating. But that's another story. By the time I buy my medicine for a month, there isn't much left for food. At least gas has dropped a bit. I paid only $3.51 cents a gallon yesterday. Just $3.51 a gallon. What a deal. By the time I paid for my groceries, and bought 3/4 tank of gas, I had spent over $100. That doesn't include the $25 I paid for a haircut at lunch. I'm one of the last of the big time spenders. I'm keeping my grandbaby today. I've nicknamed her the Ring Tail Tooter. She is so funny, and she loves to climb. I'm hoping it's cool enough today that we can go outside. She loves it out there. What necessities have you blown money on this week? Hope you have a great Saturday. Love one another. Erma Bombeck(may she rest in peace) wrote a book titled The Grass Is Greener Over The Septic Tank. I always enjoyed listening to her household humor. The stories and jokes she told were funny, and most of the time struck a chord of familiarity with me. But when I was typing an email to LisaJ this morning, it dawned on me that Erma's statement is really true. Now I don't have a septic tank, but I have a sewer line that runs from my house to the main near the street in front of my house. During the dog days of August in our area our lawns get really brown. Unless you water that is, and I can't afford to water my grass, so mine is as brown as can be. Brown everywhere that is, except in my front yard where there is a leak in the sewer line. It's not a big leak, thank goodness--but big enough to be noticable. It's about 6 or 8 feet out from the house, and is about a foot to a foot and a half across. That isn't really large in the grand scheme of things I know, but I'm not going to get the mower out to cut that small an area, and I don't own a weed eater, so the grass in that one spot gets pretty tall. It really looks funny. I should have taken a picture of it and put it with this post. We are supposed to get some rain today. Maybe my green spot will have some company. How is your grass fairing this August? Do you water or let it die back? Do you consider dead grass the one bright spot in the summer because for a few weeks you don't have to mow? Tell me your grass stories. A Modern-Day Slave, an International Art Dealer, and the Unlikely Woman Who Bound Them Together . I haven't given a book report since I was in the 8th grade. And we won't even talk about how long ago that was. If you read my blog yesterday or the day before, I can't remember which, you know I won this book in a drawing at a dinner I attended Monday night. I enjoyed the talk that was given about it and had intended to purchase it, but was fortunate enough to have my name drawn for one of five copies given away. I took it home and read the first three chapters. Chapters in this book may be as long as three or four pages or as little as one, so reading three was no great feat. Had I not been planning to come to work the next day, I probably would have read all night. I'll get on with the report now. Denver Moore was tied to the land in rural Louisianna. He was a black sharecropper just like his family before him. Having no schooling, no medical care, no money and little food and shelter, people left him to be passed from one relative to another. By the time he was a teenager, he had been nearly killed by three young white men for changing the tire on a white woman's car, and was soon living alone sharecropping a small parcel of land. He was shown a few simple kindnesses, but they were few and far between. He finally hopped a train and ended up homeless in Fort Worth, Texas. He eventually began finding food at a mission where Ron Hall and his wife Deborah came every Tuesday to hand out food and kind words. Ron was a successful art dealer and Deborah was the love of his life and the wife of their two children. Even though they had become wealthy, they never forgot their small town roots. Ron's mother made his clothes for which he was laughed at in college. Deborah was the one who soon became deeply involved with the mission, and Ron joined her there to please her. He even likened himself to a modern day Henry Higgins. Deborah was the one to spot Denver, who had withdrawn into a shell and spoke to no one. She soon made it her goal to get him to communicate. She never pushed, she just continued to tell him God loved him. These three people made an unusual trio. Both Ron and Denver were totally devoted to 'Miss Debbie' and she could get these two men to do anything she wanted them to. Their devotion continues today even though 'Miss Debbie' is now with the angels, while her work continues in the Fort Worth area missions. Ron and Denver now tour as a result of this book. They both speak, Denver preaches and sings. Each chapter is written in the voice of the person who is doing the speaking. You will read about prejudice from both perspectives. You will read about two men with different colored skin who truly consider themselves brothers. Weekend will be here soon. Have you read a book lately that makes you laugh, cry and think? Tell me about it. Actually, we've been in crisis mode ever since I got to work this morning. So I haven't had time to post. I'm just about finished with the book I mentioned yesterday. I'll try to do a book report when I'm done. I think anyone could learn some things about themselves by reading it. It does cause a bit of soul searching. Have a great Wednesday. Love one another. I've been taking my neighbor to church on my way to church. She's in her late 70's and doesn't drive anywhere but around our little town. Why don't we go to the same place, you ask? She attends Southwest Church of Christ on the west side of the big city, and I attend Valley View Church of Christ on the southern part the big city. She likes SW because her children and grandchildren go there, and I like Valley View because my children attend there, and well, I just like it there. It takes me about an extra 5 minutes to drop her off, and go back and pick her up. Our services run about the same times and we have a wonderful time visiting on the way out and back. SW has a ladies dinner once a month where the younger ladies prepare a meal for the older ladies in the congregation. My neighbor invited me to go with her, and we had a really nice time. We had a salad supper with tuna, chicken, pasta, fruit and just about any other type of salad you can think of. The daughters of the young women in charge helped with the serving. They got your drinks and kept your glass filled, and picked up empty plates and were very helpful. After we ate, a guest speaker gave a book talk. The name of the book is 'Same Kind Of Different As Me' by Ron Hall and Denver Moore. It is a true story and she made it sound very interesting. After her talk was finished, a drawing was held for five copies of the book. I won a copy. I read the first three chapters, and I think it is going to be as interesting as she described it to be. It was good to see the little ladies get out and have fun together. Most of them live alone, and this is a special treat for them. Who do you know that could use a special treat? How could you help give them a special treat? Have a great Tuesday. Love one another. I got this picture from my DIL that she had taken of Superhero and Princess#3. He is 4 and she is 1. He can't read on his own, but he remembers enough of the story that he does a pretty good job of making you think he's reading. 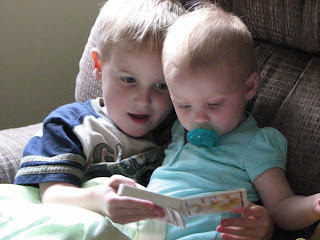 P#3 doesn't sit still often, but she likes for him to read to her. I always dread Monday's. I always wish I had just one more day off before coming back to work. I should be thankful I'm able to get my lazy self up and come to work, but being the human person I am, I think of my own selfish wants before anything else. I had all three of my children at the house for lunch yesterday. Also all of the grandchildren were there except one grandson. We had an enjoyable lunch, then everyone went off in different directions. Some of them had to go home for naps, some to a baby shower. I took a nap after they all left. What did you do Sunday afternoon? Did you take a nap or did you have other events you had to participte in? I need to know. This information will tell me whether I'm normal or maybe I should change my habits and be more productive. Have a great Monday. Love one another. We took our friend to eat for her birthday last night. The company and fellowship was wonderful as always. The place we ate was a total disappointment. It was one of those Japanese places where you can either sit at the grill and be entertained or you can be stuck in the back in the dark and hope a waitress comes to take your order. There was a wait for the grill, and being old, we needed to eat before our bedtime, so we went to the back. We finally got our drink order placed, and would have liked to ask a few questions about the menu, but weren't given the opportunity since we had to finally go find someone to take our order. If you've been to one of these places lately, you know the food is quite expensive. And I feel it is very overpriced when you have no clue what any of it is and can't seem to find out. 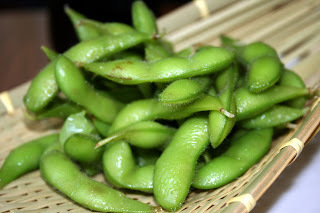 I ordered Edamame(soybeans). Thought they'd be good. I thought they needed to be cooked a bit more and they had no taste whatever. There were four of us so we decided to split two orders, for which we asked for two extra plates. By the time the extra plates came, we had eaten all the food. Remember it was getting late and we were all hungry. The food was cold, the service poor and the cost was high. Needless to say, we weren't terribly happy with the choice, but we didn't say much because our birthday girl had chosen it. We finished the food, paid and left. I don't think I'll be patronizing that particular Japanese restaurant any time soon. I'm kinda a buffet girl anyway. That way I can see what I'm planning to eat before it is put in front of me. I've whinned enough this morning. So, I'll ask, Are you a 'serve it to me' or a 'buffet' type of person? It will speak volumes about your personality, temperament, and possibly waist size. I want the Contractor to take me to work every morning! Why you ask would I want my son to take me to work? After all, I'm perfectly capable of driving myself anywhere I want to go--well, maybe almost anywhere. This morning as I was coming over the railroad tracks in the right hand turn lane, I heard a horn honking. When I looked to the left there was the Contractor and Superhero both waving. I was very happy to see them and get to start my day with their smiling faces. Now you understand why I want to ride with them to work each day. I'm so thankful that my son has a profession that allows him to do this sort of thing. He doesn't punch a clock nor is anyone standing in the doorway wondering why he isn't at work yet. He is able to spend quality time with his children. That's not to say he doesn't work some long hours. He was on the jobsite until 8:30 last night trying to get as much of a roof on the house he's building as possible before it rained. But he has the ability to adjust his schedule so that he can take either or both children to their respective desinations each day when he needs to, and he can pick them up if necessary. Who do you want to ride to work with? It does get lonesome on that commute each morning. Have a wonderful Thursday. Love one another. I think some people call this Wordless Wednesday, but if you know me well, you know I can't go a day without speaking. That said, I don't have a lot to talk about today, but I got this cute quiz yesterday from a friend. It's for all you kool kats and slick chicks. There are 18 questions. Write A,B or C and then at the end you can see just how kool you really are. 4. 'I found my thrill...' where? 9. Name the song with 'A-wop bop a-loo bop a-lop bam boom'? 10. Who is generally given credit for the term 'Rock And Roll'? TV show was he on? How many did you get right? I missed 4, they were 2, 12, 14 and 18. Hope you have a great Wednesday. Love one another. I got to go pick up this handsome young man yesterday. I took him to get ice cream and most probably spoiled his dinner. But that's one of those things a Memaw gets to do. As we were coming home, he asked, 'Memaw, do you know what I want to be when I grow up?' I told him no, what did he want to be? He said he wanted to be a dog brusher. He wanted to give dogs a bath, clip their fur and brush them. I told him I thought that was a good job, but what about being a cat brusher too. He then asked what I wanted to be when I grow up, and I told him I would like to be a cowgirl that ropes cows and shoots bad guys. He suggested that instead of that, that I should be the cat brusher. I explained that I really didn't want to be a cat brusher when I grew up, that I'd rather be a cowgirl. He said I probably should just be a Memaw instead. It was such a cute conversation. He is so matter-of-fact about things. What do you want to be when you grow up? I know I can't be a cowgirl, but since I don't consider myself grown yet, I should still have a few possibilities. I guess being the best Memaw right now is my most important thing to be. I hope you are having a great Tuesday. Love one another. Although I don't live on a working farm, this is what is growing across the road from me. My family did raise cotton, and I think it will always be in my blood. I had talked about the process of raising cotton in previous posts, and this is what it looks like now. The blooms can be either pink or yellow. Those you see in this picture, are pink. As the blooms fade and fall off, you see what is called a square. You can see two of those in the lower part of this picture. In the very center of this picture, is a boll. Once it is mature, it will turn brown, and open. It contains the cotton. If you look just below and left of the green boll, you will see a square and in the lower right corner what is left of a pink bloom. When we picked by hand, we didn't wait for all the bolls to open, so there were usually quite a few green bolls still on the cotton when we picked the first time. These made great ammunition if you were picking near someone you were mad at or didn't like. Throw one at them, and bend down like you were working hard. This is a view of what I see when I look out my front door. It is quite green and lush and I can see some of the blooms shining in the sun. Since I don't have anything blooming in my yard(remember I killed my plants on the front porch), I don't mind seeing the field so green and lush. I started to use the word verdant in my description, but figured one or both of my daughters would have something to say about that. Here's the reason I didn't post on Saturday, and why I was too tired to post on Sunday. I just can't seem to get enough of this little girl. She's so sweet, and such a good baby. What is something that prevents you from posting? We all have busy lives. Doesn't seem to matter if you are working full time, or retired. There's always something to do. Please have a cool Monday. Love one another. Check on a neighbor to make sure they don't get too hot in this heat. And those of you in the hurricane's path, make plans to be safe. Enjoying or characterized by well-being and contentment. That's the definition of happy in the Merriams-Webster Online Dicitionary. Are we happy all the time? I don't think so. I'd classify myself as happy about 85% of the time. There are times when things make me sad. There are times when I'm frustrated or angry. Especially when things don't go my way, or my money doesn't make it to the end of the pay period. I'm not real happy when I'm pumping gas and it's nearly $4 a gallon. I'm not very happy when I am forced to listen to the two presidential candidates talk on tv. I'm not very happy when one of my grandchildren gets in trouble or hurts themselves. Wait, I'm telling you all the times when I'm unhappy and this is a post about being happy. Let me see if I can list some times when I'm happy. 2. When my grandchildren hug me. 3. When I'm with family. 4. When I'm with friends. 5. When there's good food on the table. 6. When I've paid all my bills and have enough left to buy gas. 7. When I get on the scale and I've lost a lb or two. 8. When I have clean sheets on my bed. 9. When my house is clean and the yard work has been done. 10.When I have time to just sit and reflect. You might think my reasons for happiness are simple, but in fact it doesn't take much to make me happy. I can't always say I'm content with everything in my life, but generally I'm a happy person. I've always thought of being happy as a state of mind. I see people who are unhappy, no matter what happens. They always see the down side of everything. Maybe I don't pay enough attention to what's going on around me and if I did, I might not be so happy, but I think I'd rather go through life with blinders on and miss out on all the bad things in life than to be so highly tuned into what's going on around me. They say ignorance is bliss, but maybe that saying should be ignorance is happiness. Doesn't have the same ring to it does it? I don't want to be ignorant, I just don't want to be jaded by the world around me. And if I'm blissfully ignorant, well, it's just what I want to be. What makes you happy? You don't have to list 10 thngs, just one or two. I'd like to know. Have a great Saturday. Try to stay cool. Love one another. I was talking to my neighbor who lives behind me yesterday. We were talking about the heat and how much more we would endure before fall sets in and things cool off. She had mentioned to me a few days ago about the heavy foilage on the trees. She said the Indians knew this meant a hard winter. As we spoke yesterday she mentioned it again. I remembered that a lady I worked with several years ago had told us that if you counted the fogs in August, you would know how many snows to expect that winter. Well, guess what! The people on the news this morning said to watch out for fog this morning, and guess what else, this is August 1st. And as the old joke goes--baby, that's one. I'm anxious to see how many more there will be. I also wondered if dove hunting season had started this morning. It sure sounded like someone was shooting at something off in the distance. Then I remembered seeing several stacks of shingles in my neighbors yard yesterday afternoon. The roofers have arrived and are getting as much done as possible before the heat really gets started. And if its the roofers I think it is, they will be done before noon. I'm thankful it's Friday. It's been a busy week at work. No time much for reading my favorite blogs--sorry folks, I'll catch up tomorrow since it will be entirely too hot to go outside. I do try to keep up with Robbin over at Cedar Chest of Dreams . She's going through a lot these days, and needs the love and support of all her blog friends. Also Marge is dealing with the loss of her precious mother. She needs you good thoughts as well. What do you predict your winter will be like this year? I know my blog friends are all over the US and maybe even some in other countries. I know predicting weather will be much more fun than predicting who our next president will be. Have a fantastic Friday. Love one another.